Even if you go to the most distant tavern in Greece you will find this traditional recipe, it's a first choice for an appetizer or as we say a meze. 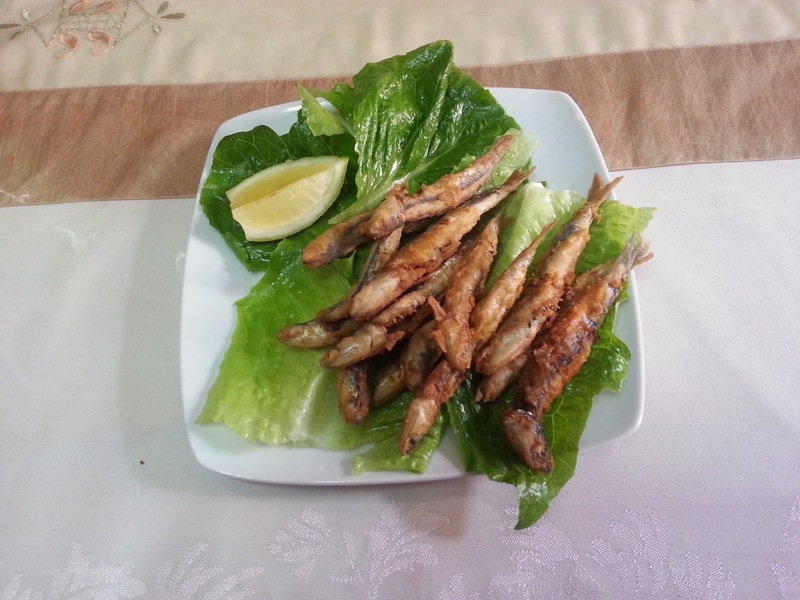 This was my dad's favorite summer meze and mine too.Whitebait in Greek is pronounced Marides and they are so delicious ! They are eaten whole with the head. 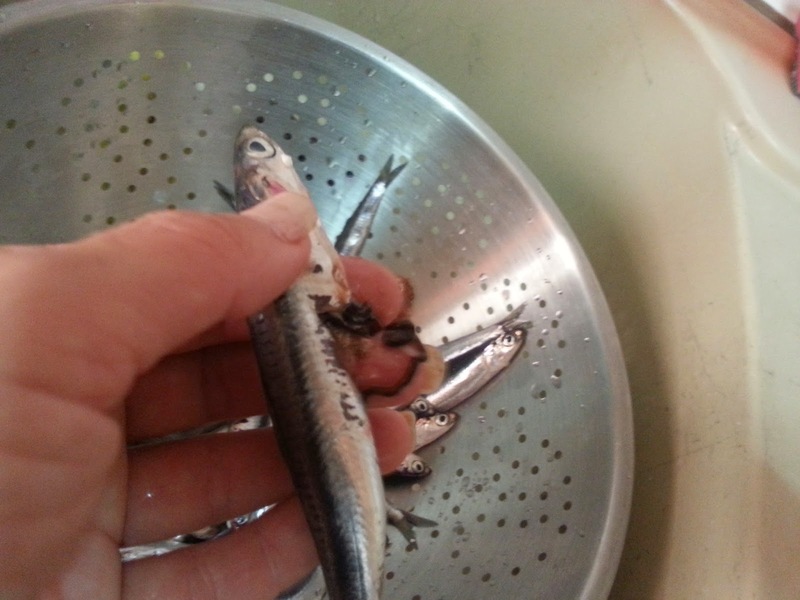 Use a small knife to take out the intestines, place in a colander and rinse with plenty of water. Let them drain add salt, if you like them spicy add pepper. I prefer them with just salt. 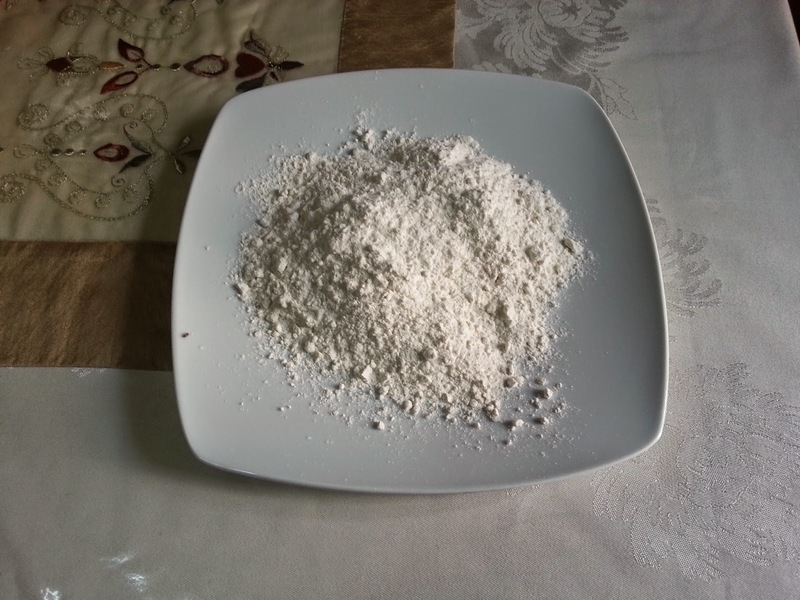 When they are ready place them in your plate with flour. 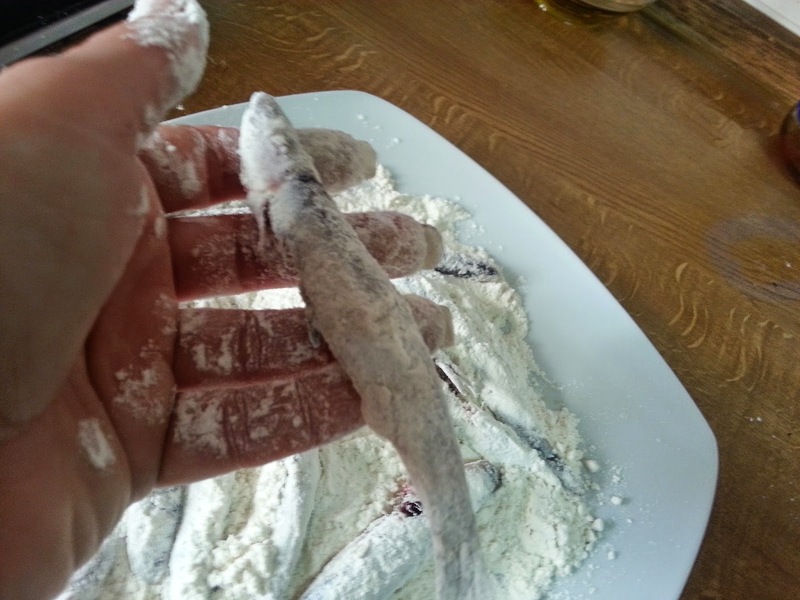 Roll them in the flour and remove any excess flour. I used two cups of olive oil. 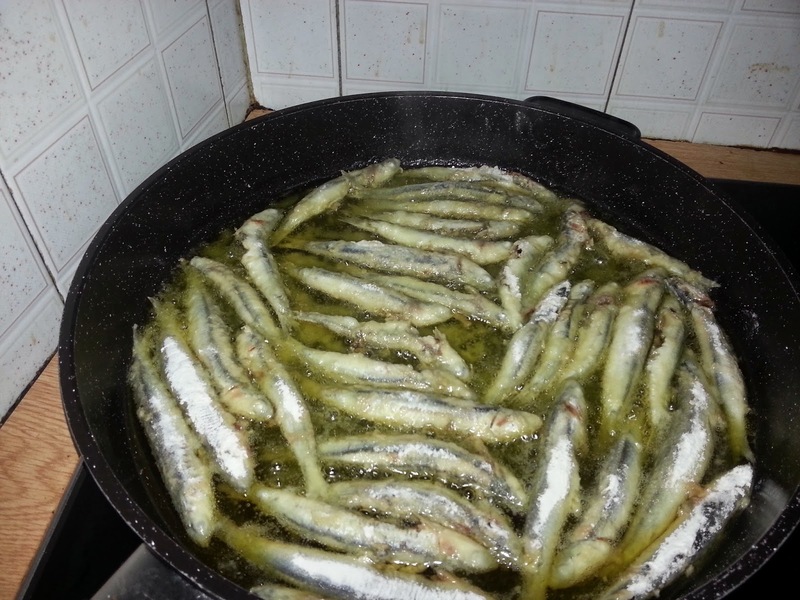 Your olive oil should be sizzling hot before you place your whitebait inside the pan. 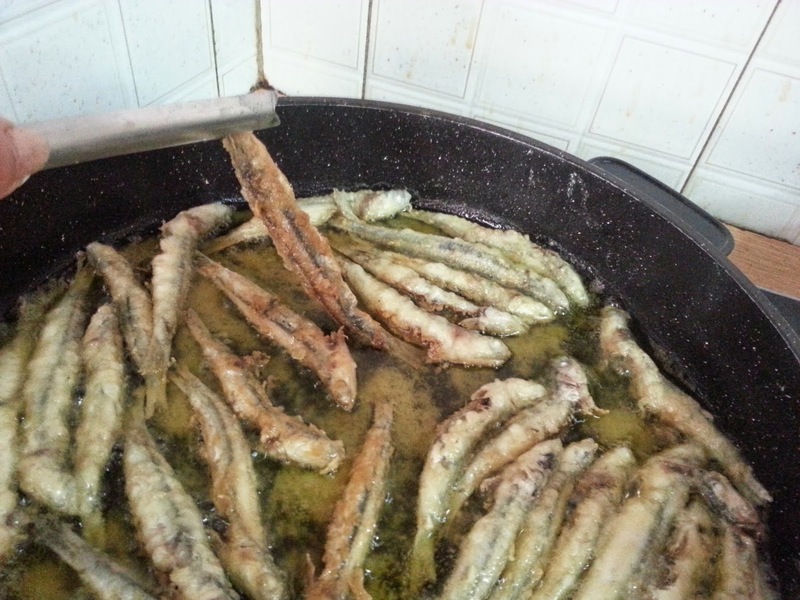 This is how I layed them in the skillet, some people like to deep fry them. Deep frying them is easier and faster but I prefer to make them this way. 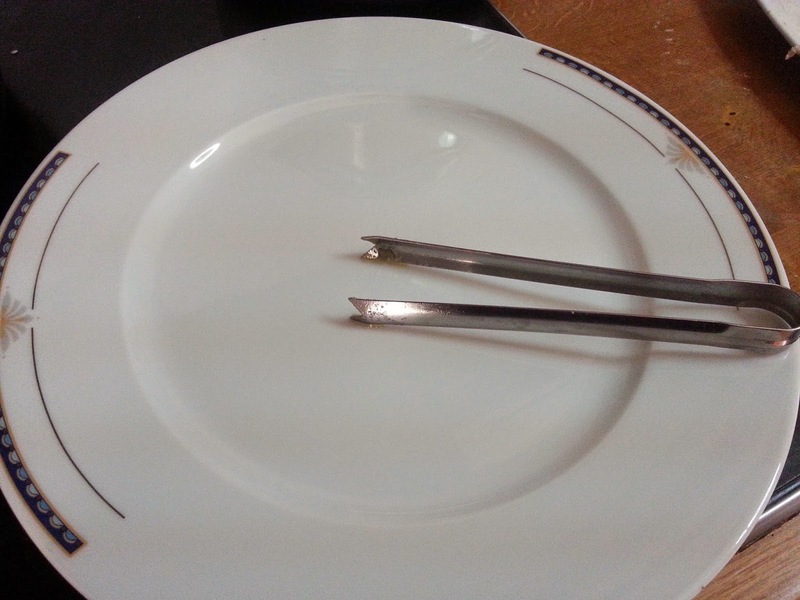 I used these small kitchen tongs to turn them. When done set your oil aside. 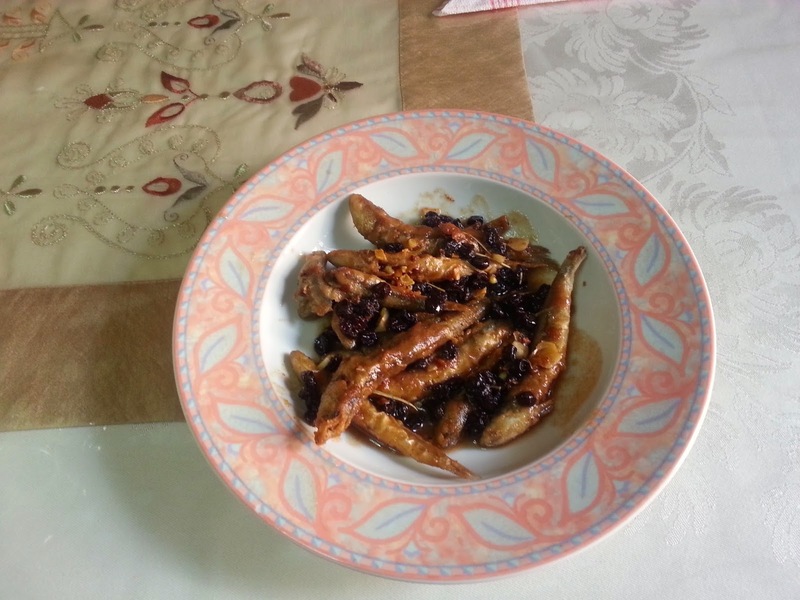 Once you have fried all of your whitebait, you are ready to make your raisin sauce. 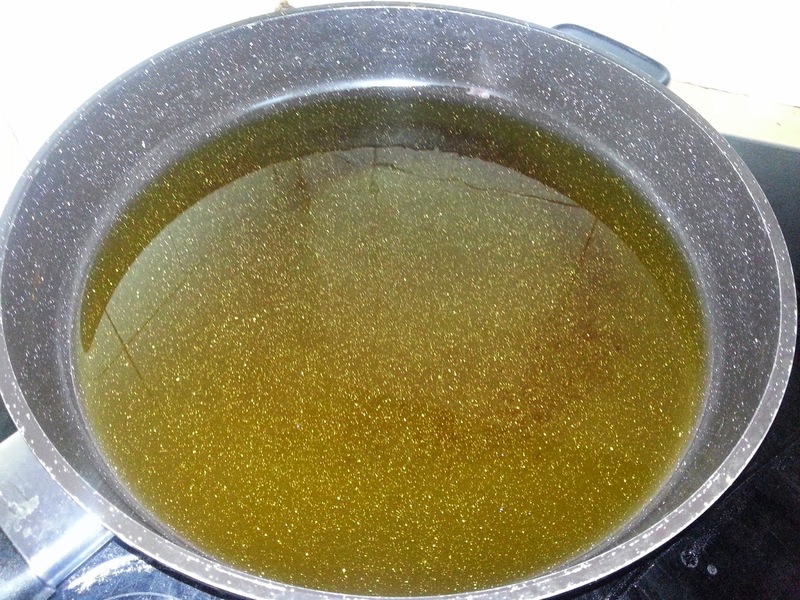 First, place your skillet with the remaining oil on high heat and let it sizzle. 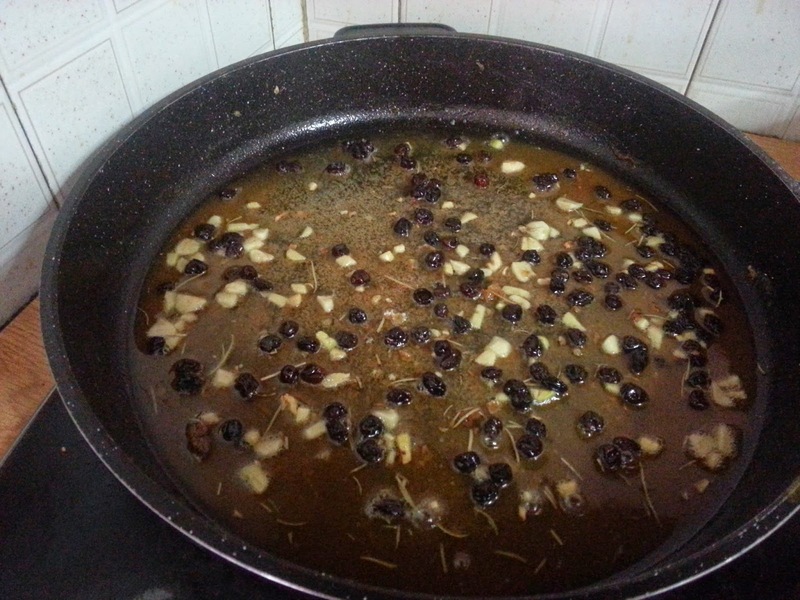 Secondly, add your raisins, garlic and rosemary. 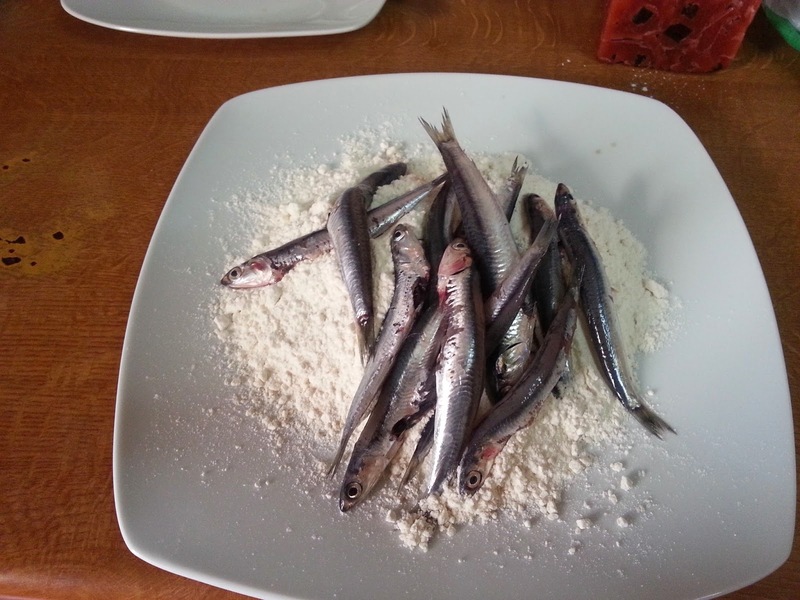 Cook them for about 20 seconds or until the garlic is slightly browned add your vinegar and pour over your white bait. Serve them nice and hot, dip some Greek bread and enjoy !! This is the gourmet way to serve them. 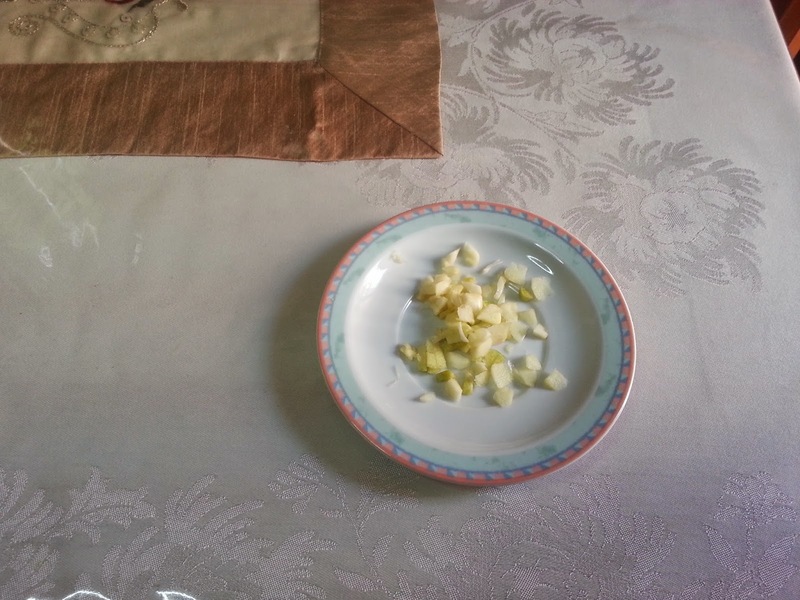 The picture below is the most common way that they're served. 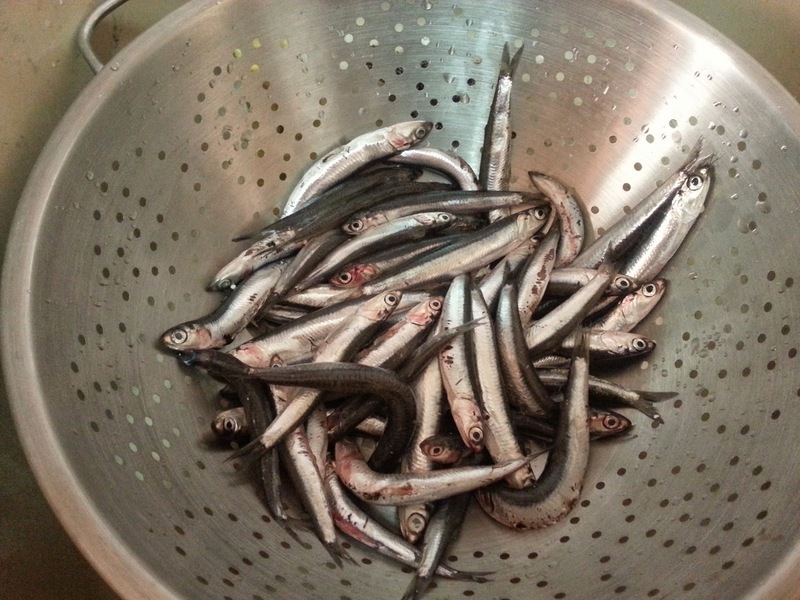 Either way the whitebait is delicious. Don't forget to serve them with a nice chilled glass of dry white wine. KALE OREXI !!!! 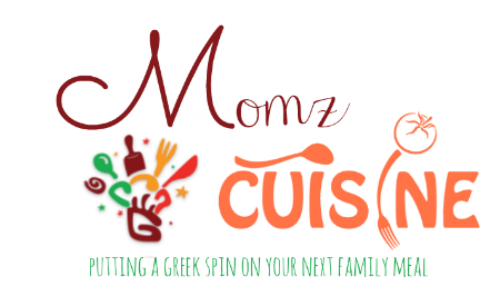 If you have any questions regarding this or any of my recipes, don't hesitate to contact me. I would love to hear from you. G'day! 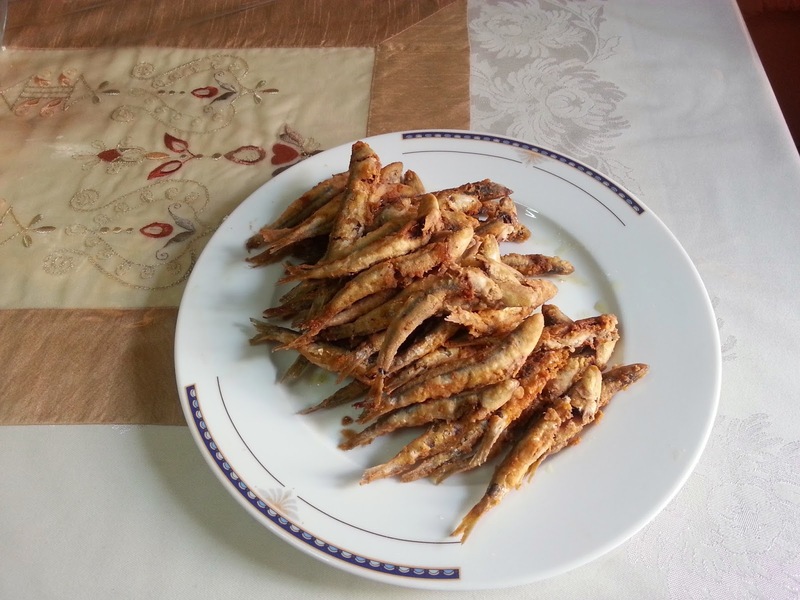 I used to use whitebait as bait, but understand like sardines (which I love) these too are a delicacy! The raisins and the rosemary make all the difference. I am not familiar with this item. I love fish and most seafood. So I don't know whether I would try these or not. But I will definitely be back to visit your blog again. I love learning about new food. Thanks for visiting my blog. Looks like a great batch of fried fish to me! My mom used to fry foods like this while I was growing up and I always loved them! @Pattipeanut, if you love most seafood, I guarantee you will also love this one ! @Zan it's an excellent batch of fish !! I never had this before and I love fish. Thanks for the recipe. You can only enjoy this recipe if you are a true fish lover. 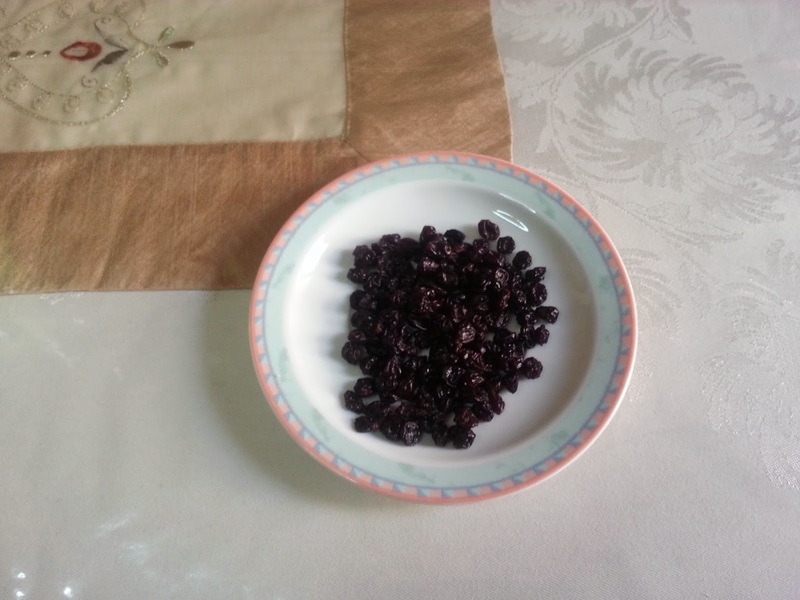 I loved joining your blog party, looking forward to another one. You can find them at almost every tavern on Corfu Island.